What is Asafoetida - Asafetida? 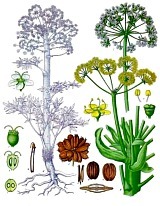 Asafoetida-Asafetida (other names: Angedan, Devil’s Dung, Stinking Gum, Stink Finger, Food of the Gods, Hing, Perungayam) is the milky resin from a giant garden fennel. It has a fetid, strong pungent smell that disappears during the cooking process leaving food flavored nicely. 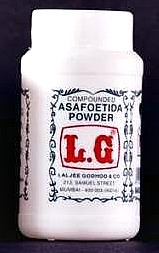 Asafoetida is a possible flavor substitute for onions and garlic, especially if an allergy, or religious observance is required (abstaining from onions and garlic - e.g., Jainism, Vaishnavism, Brahmins, Hindu satvik, Shojin-ryori Buddhist). Odor and flavor of Asafoetida becomes more desirable (similar to sauteed onions and garlic) after heating it in oil, butter or ghee. What is the Origin of Asafoetida - Asafetida? It is indigenous to Afghanistan, Iran, and northern India. Its name is a Persian (aza meaning resin) - Latin (foetida meaning sulfuric) blend. Plants were taken to Rome by Alexander the Great after he invaded Asia. This herb is used primarily to flavor Indian and Middle Eastern cuisines, especially vegetarian. Used in Afghanistan for dried meat preparations, and as a seasoning for meatballs in Iran. 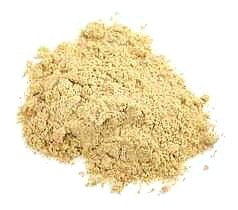 Asafoetida is great added to any bean or pea dishes. No need for store-bought gas relief meds. It is a good flavoring for legumes, lentils, vegetables, and fish. Use just a pinch (size of a pea); like saffron spice, a little can go a long way. Keep small quantities of asafoetida, usually in powder form, and replace within about 6 months. What Are The Health Benefits of This Herb? Asafoetida has been eaten to alleviate cold symptoms, and to reduce flatulence and stomach gas. Digestive aid. Has anti-inflammatory properties, natural blood thinners, and may help reduce blood pressure. Has been used in folk medicine for colds by tying some of the resin in cloth around the neck.